Seen this book cover popping up anywhere lately? It's 7: An Experimental Mutiny Against Excess by Jen Hatmaker (also the author of Interrupted). I tell you, this book came at exactly the right time in my life. I've had simplifying on the mind for weeks before I picked up 7. 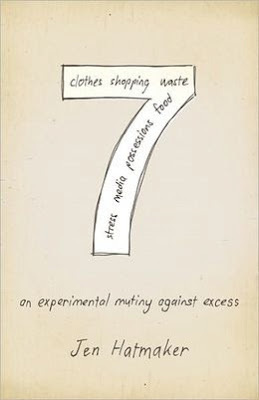 In the weeks that preceded me opening the cover of 7 for the very first time I was becoming more and more upset about the excess of extravagance we live with and the poverty, oppression, slavery, and sickness the majority of the world lives with. It's not hard, here in middle class America, to think of ourselves as just that- people economically on the middle of the spectrum. When comparing ourselves to the people around us who have bigger houses, newer cars, more expensive clothes it isn't a challenge to buy into this lie. But let me rock your world for a moment if you will. If you make $35,000 a year you are in the top 4% of earners on the planet. Make a little more at $50,000? Well then you're in the top 1% of earners on the planet. This is no joke or statistic to read now and forget later. This is a huge deal. We're sitting here in our air conditioned living rooms with the TV playing in the background while we browse Pinterest and conspire to create bigger houses, collect more fashionable clothes, and make the 8th chocolate chip cookie recipe we've tried this month. Why are we so sold on our culture's lie that we need to be constantly striving for more things we don't really need and probably won't use while the vast majority of the world is merely trying to survive another day? Okay, I apologize. No need to get on a soap box. I know I'm preaching to the choir here. Did I really need those buy 2 get 1 free earrings at Franchesca's? Nope. Did I really need to buy that gray maxi dress at Old Navy I'll probably wear 5 times this summer? Nada. Do I really need to go to the grocery store 4 times a week when my pantry is already crowded for space with perfectly good food? Guilty again. Y'all have to check it out. I'm not kidding. It will change your life and bring you so much freedom and joy. Don't make me buy you all one for Christmas and then bug you till you've read it. Let's do this the easy way. Anyone else out there up for being completely crazy and doing our own little version of 7 with me? I like the way this sounds. Thanks for sharing about this book! I loved sitting with you. You have the best smile. Yall have sister smiles in that picture. I'm hoping to start the book soon. Working on finishing another one about grace right now. I think I'll need it for when I start 7!